The SoundTrap ST4300 is a four channel digital acoustic recorder for ocean acoustic research. Its ability to record synchronous audio on four channels make it ideal for creating tetrahedral arrays for sound localisation and particle motion studies. The ST4300 can record signals from up to four hydrophones connected via the four wetplugs on the base of the recorder. The hydrophones are the pre-amplified type, and can be on long cables to enable array spacing’s of several meters. 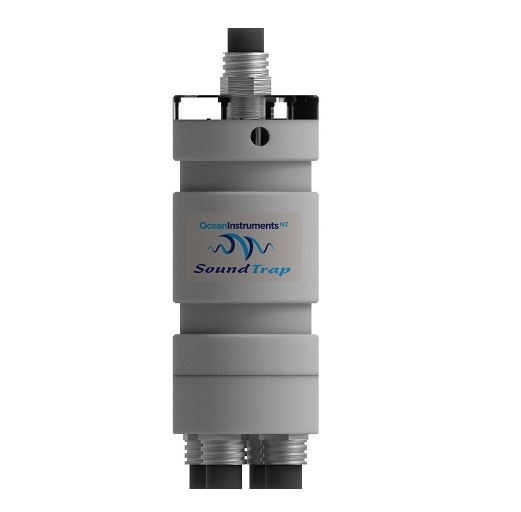 Suitable hydrophones can be specified with various gain and bandwidth options. An internal battery enables four channel continuous recording for up to 8 days, or 24 days on a 10 minute per hour duty cycle. For longer deployments plug in the optional external battery pack for up to 30 days continuous recording. 128 GB of internal memory coupled with lossless audio compression provides storage for up to 16 days of continuous four channel recording at 36 kHz (32 days for the 256 GB version). Data offload and battery recharge are done via a wet connector. The housing therefore never needs opening, thereby eliminating worries about o’ring maintenance and moisture ingress. Output files are in the industry standard WAV format. Ancillary sensors are included for logging temperature and tri-axial acceleration. The included software offers flexible deployment options for channel selection, sample rate, delayed start and duty cycle. For further details see the spec here. The SoundTrap ST4300 recorder currently has a 2-3 week production lead time. Please contact us to confirm.